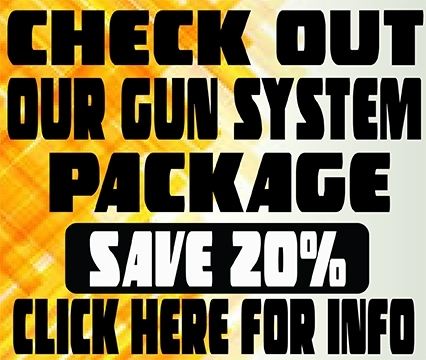 Are you a gun owner having trouble finding the right holster for your concealed carry needs? Have you tried several models, only to be dissatisfied with the quality and fit? 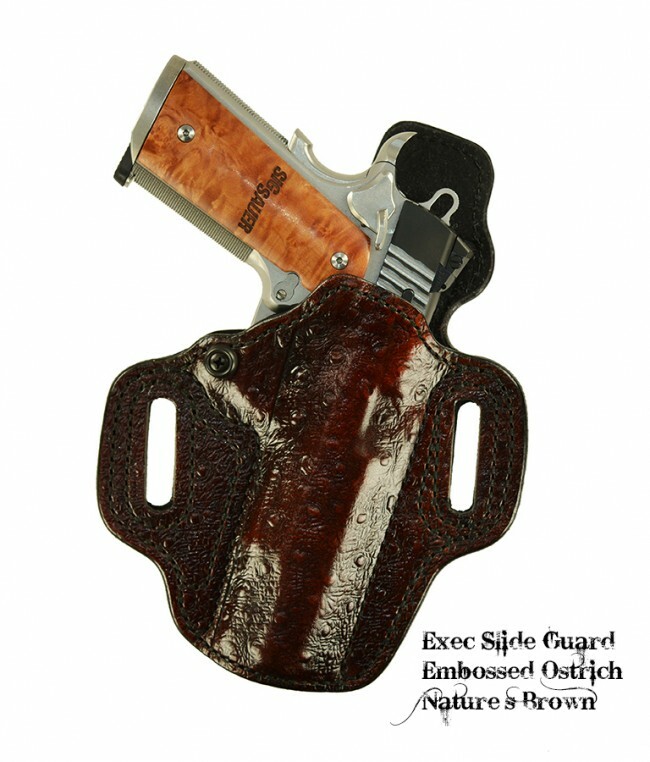 The Executive Slide Guard holster from High Noon Holsters can provide an excellent solution. We can manufacture an Executive holster to your specifications that will serve you well for years to come. 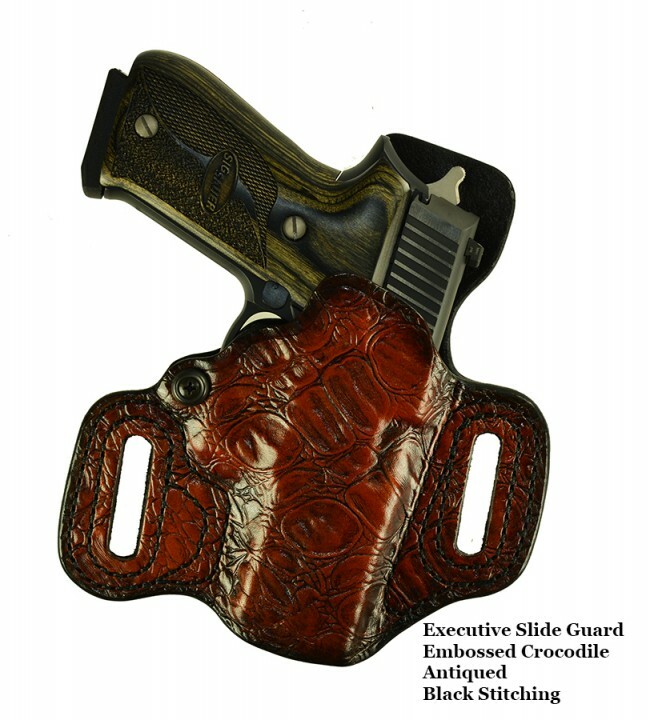 The Executive Slide Guard is molded to the gun for which you order it. We have taken our traditional Slide Guard and enhanced the design. You now can take our popular Slide Guard and add antiquing as well as embossing the trim with a variety of designs and color schemes. The executive line is crafted and painted by hand. You will not find a better-handcrafted gun holster on the market. 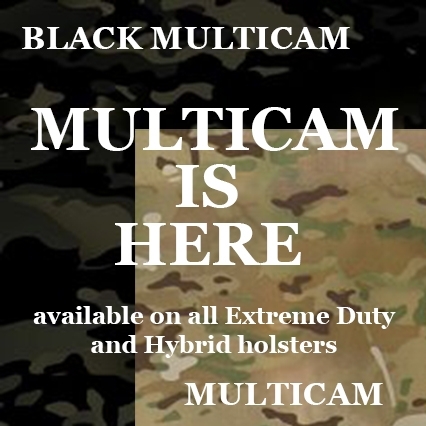 Still the best and highest quality holster anywhere but with a little more to offer the gun owner. The Slide Guard is manufactured specifically for the customer. With the Executive Slide Guard, you can choose from a selection of embossing designs and colors. The Slide Guard, a leather gun holster, allows for a faster draw and is molded to the gun for which you order it. This is also a high ride two-slot holster. It features a slide guard, hence the name, which prevents the slide, hammer and sight from wearer contact. It is superbly hand molded for a secure fit. It has double stitched seams, 15-degree forward cant, a covered trigger guard, open muzzle design and a tension screw for adjustment of the draw. The recommended carry positions to wear this holster are the 3, 4, or 5 o’clock positions. It is made to fit up to a 1-3/4″ belt (1-1/2″ is optimum) and is available in right or left hand. 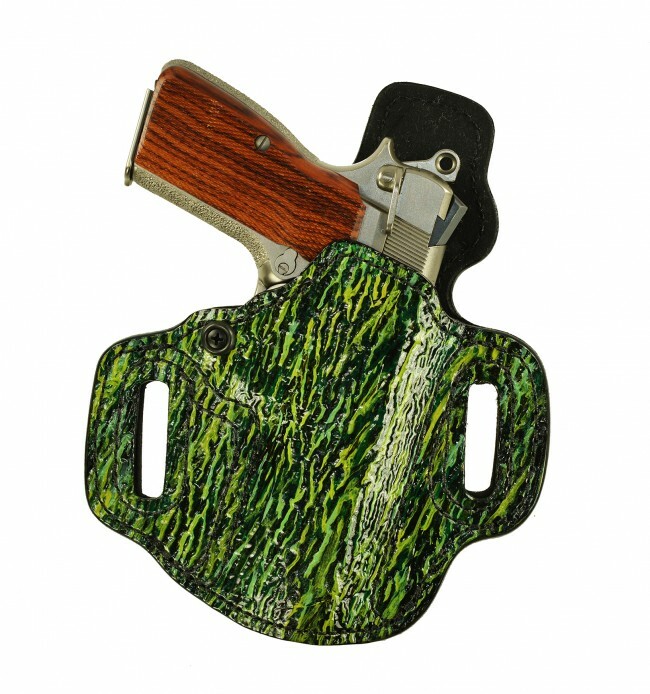 This holster is unlined and is IDPA Approved. 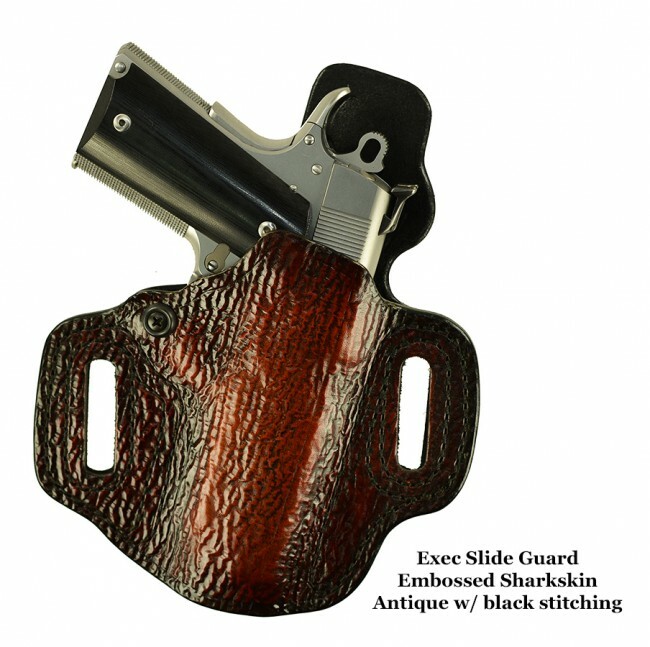 The Slide Guard is a custom-made gun holster – therefore it is not a stocking item. We do have a RUSH SERVICE available if you do not want to wait. 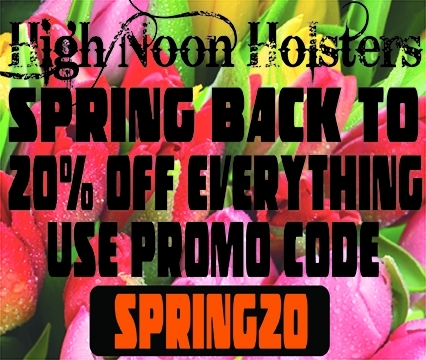 Here at High Noon Holsters, we've been manufacturing holsters for more than 20 years. 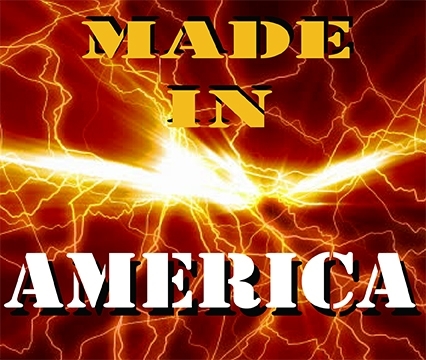 We've earned a stellar reputation for the quality of our craftsmanship — we're a U.S. company that takes pride in creating American products that are made to last. Because we custom-make each executive holder, you can be sure it will provide the ideal fit and meet your expectations in every way. But if you view your holster as less than perfect when you receive, let us know right away, and we'll do everything possible to correct the issue. If you're still not satisfied, you can return it to us within 14 days for a refund — no questions asked. 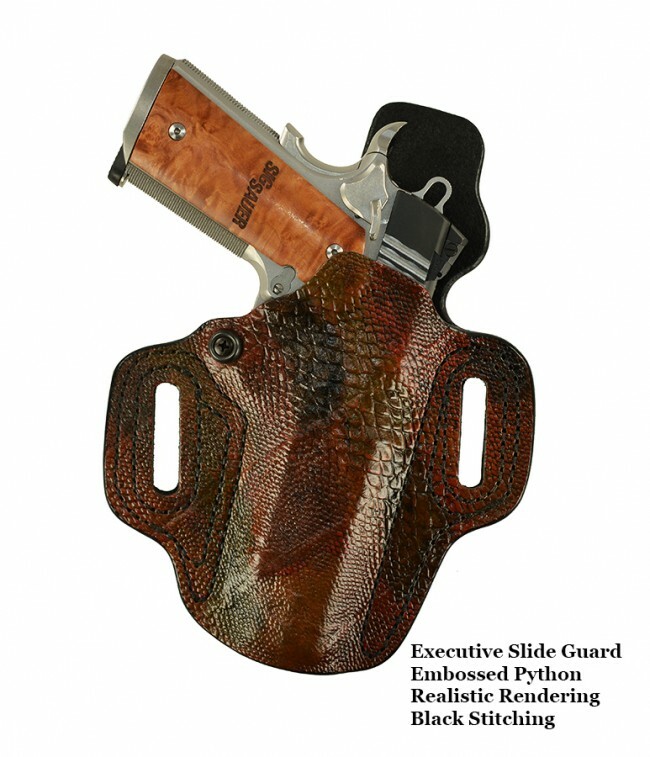 We make the process of purchasing your Executive Slide Guard holster as quick and hassle-free as possible. As part of our commitment to achieving 100 percent customer satisfaction, we've redesigned our e-commerce site to make it as user-friendly as possible. To place your order, begin by adding the item to your wish list. When you're ready to finalize your transaction, you can do so by completing the secure checkout process. You can also select the payment method that works best for you — available options include Discover, MasterCard, Visa, American Express and PayPal. Get an expertly crafted holster designed to provide the ideal fit for your weapon and deliver the quality and durability you demand and deserve. Take a closer look at the Executive Slide Guard holster from High Noon Holsters right now. Feel free to contact our knowledgeable customer service team to discuss your customization requirements. We'll also be happy to assist you with ordering and shipping.